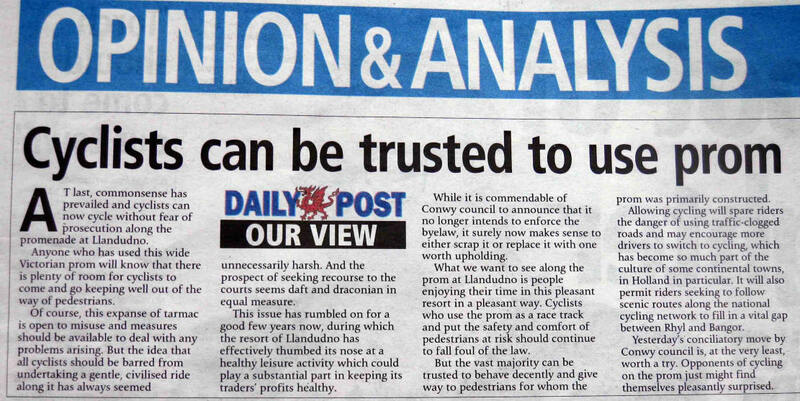 News Update: Feb. 2012: Conwy Cabinet have decided to allow unrestricted cycling on Llandudno promenade for a trial period of one year. See News Snippet. 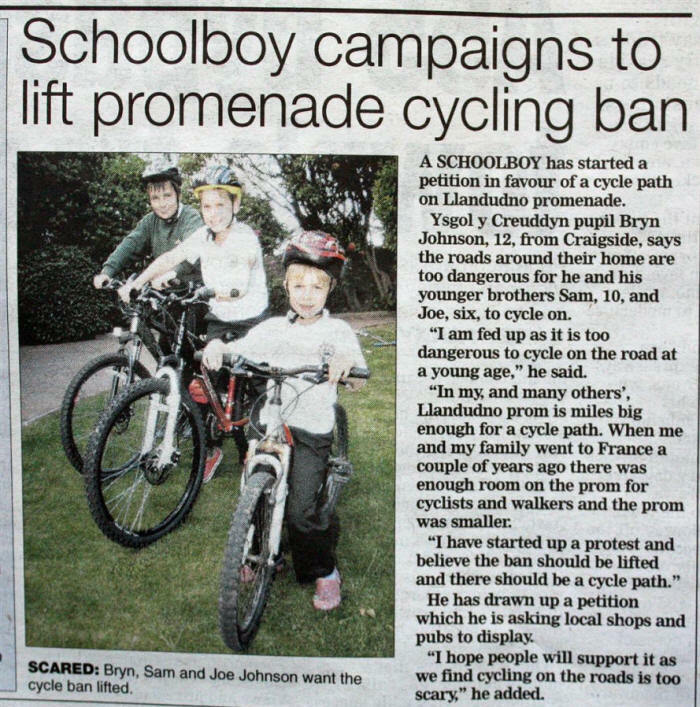 In a sudden breakthrough in the five year saga of the so called 'cycling ban' on Llandudno promenade in the County Borough of Conwy, the council has now accepted that it is not in the public interest for cyclists to be forced to use the adjacent hazardous Parade, and cyclists will be allowed to proceed responsibly along the one and a half mile promenade without fear of legal consequences, pending a definitive decision by the council. 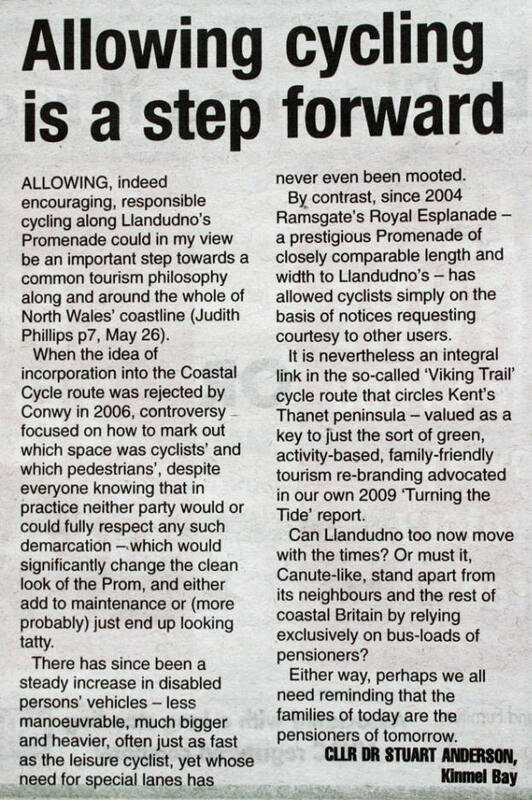 "...pending a policy decision, there appears to be no merit in bringing prosecutions against people who cycle on the promenade in breach of the byelaw. It seems to me that it is likely to be not in the public interest to pursue prosecutions during this time. That said, were cyclists to injure third parties while cycling on the promenade they do so at their own risk and, I think, risk invalidating any insurance cover they may otherwise have, as they will be acting contrary to the extant byelaw." 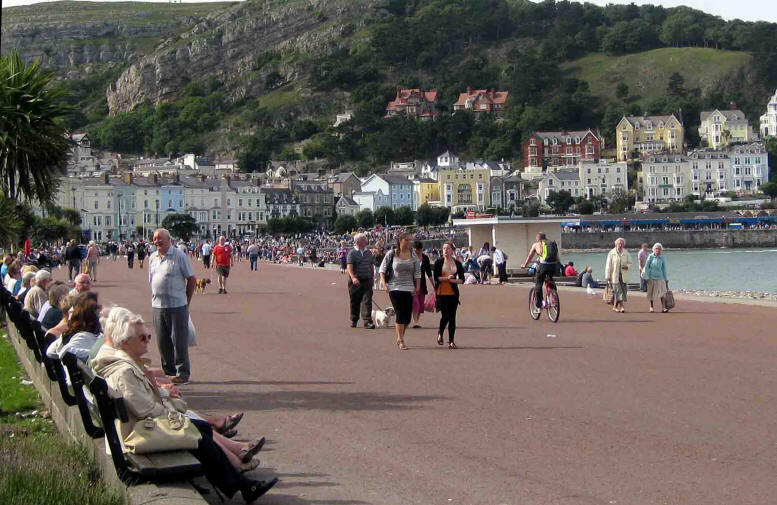 After five years struggle, CTC Cymru welcomes the decision by Conwy CBC not to prosecute cyclists for riding responsibly on Llandudno promenade. It is an immense relief that those cyclists who faced serious injury or worse using the Parade, may now ride in and out of the town in safety. CTC trusts that all cyclists will give priority to pedestrians. and respect the comfort of all - including other cycle users. Conwy Borough Cllr Stuart Anderson (L) and Gareth Parry (R). 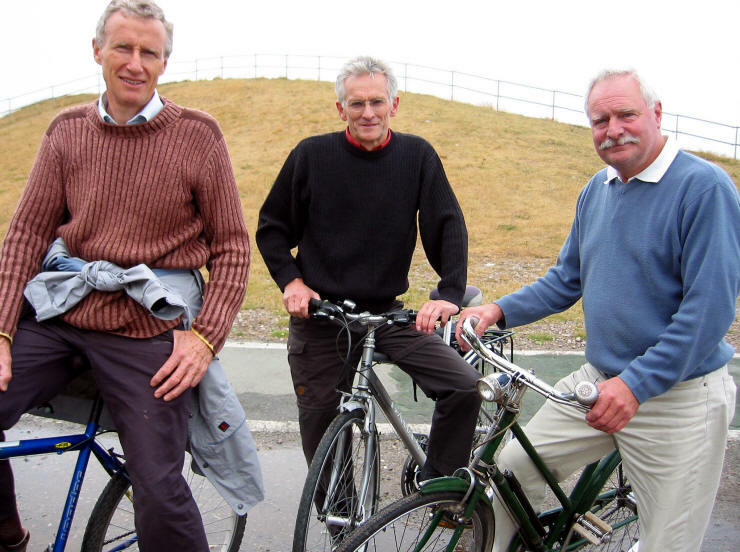 Stuart is a retired medical practitioner and he and his close friend Gareth, former community cllr, have been long-time supporters of motor-free community routes. Here they are seen showing a visitor from the USA the North Wales coastal cycle path near Llanddulas.